This setup is for beginners who would like to get clued on to the correct market direction. That said, beginners or experts, profits are profits. So, you can try this out even if you’re a pro. Before you use this setup, know that it works best for the Indices (Nifty, Bank Nifty, etc.). It also can work for individual stocks, and you should experiment with it. Search for any stock, or for NSEI, which represents the Nifty Index. I have used the Nifty in this example and all that I write here, represents actual trades. View this image and let’s move to the next step. Now register for free at TradingView.com – know that Trading View delivers delayed data to free accounts but as the trade setup suggested here lasts at least 45 minutes to 2 hours, the delay does not matter as much. b. Squeeze Momentum Indicator (You’ll find this under the same icon in the Public Libraries). Right, we’re all set up. RSI is a momentum indicator. Anything over 70-80 indicates overbought; anything below 30-20 indicates oversold. In between the trend keeps moving up or down per price movement. 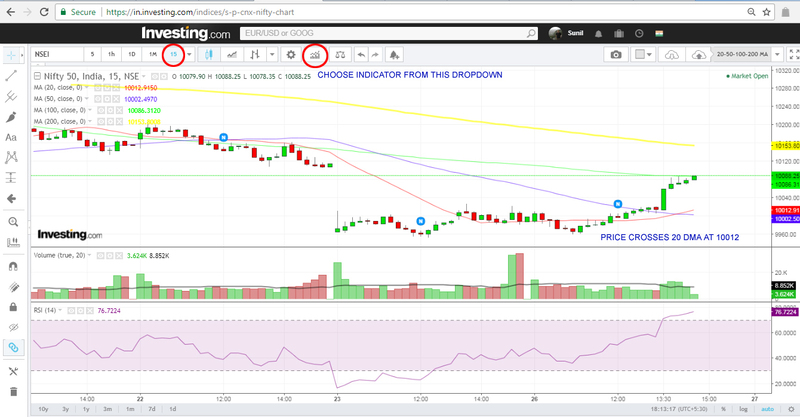 Supertrend uses ATR (Average True Range) calculations and places buy and sell pointers (arrows) on charts. Squeeze Momentum Indicator calculates volatility of a stock. When volatility drops to 0 or near 0 levels, it implies that the stock is getting ready for an explosive move in any direction. Therefore to use the Squeeze Momentum Indicator, you must wait for a confirmation (the next formation) before taking a position. Or, if Supertrend or Untimate MA suggest a buy when volatility is down, you can act based on your risk appetite. As the market was choppy, and the future uncertain, a decision was taken to focus on day trading. Accordingly, the candlestick time period was set to 15-minutes. Investors can play around with 1-Day or 1-week settings as well, while traders can also try out the 30-minute setup. My favorite is the 15 minute time intra day period. At about 11.45 AM, the Nifty spot price crossed the 20 DMA (at around 9995), indicating bullishness. At the same time the RSI also started moving up from 45 levels. Interestingly, at around 12 PM, the Squeeze Momentum Indicator displayed volatility at its lowest (near 0), indicating something big was about to happen. The next 2 bars confirmed a bullish trend for the day. 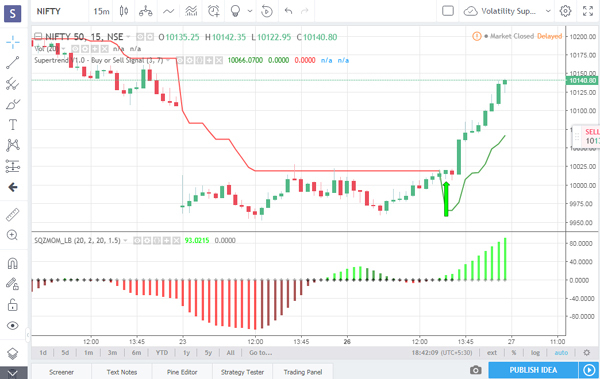 The Supertrend indicator threw up a buy signal at around 12.45 PM, when Nifty was 10015. All systems were a go then. Now, at 11.45 the Nifty 10000 28 April CE was available at 48; and between 12.30 and 12.45 PM, it was available at 60 and 73 respectively. It was snapped up at all levels (48, 60, 73). The Nifty started spiking and the 10000 CE hit about 117 resulting in handsome gains. Well, this setup works for me and it should work for you as well. Try it, but do not trade for real until you are comfortable with it (it will take 4-5 days). Also, do not be rash. Watch the news, technicals, etc., before attempting any trades and always work with a SL. Good luck. 25 Comments on "This Trade Setup Results in Profits"
Currently i have zero knowledge about chart analysis, Can you please also start blogging from basics..The UI looks cool. Thanks for the chart setup. I got registered with Investing.com and tried to set up i could find MA and other indicators but not Supertrend & Squeeze Momentum Indicator (You’ll find this under the same icon in the Public Libraries). Pls advice. You need a free account TradingView.com for that. Please read the article again. Thank you jee. I got it. Sir your setup was working very nicely I managed to end up with profit today. Thanks for the additional indicator. this is very useful to study nifty direction. Thanks a lot. For stocks use 1 Day candles for positional trades and work only with FNO stocks. Ichimoku cloud gives you the stop loss levels. Supertrend tells you when to enter. 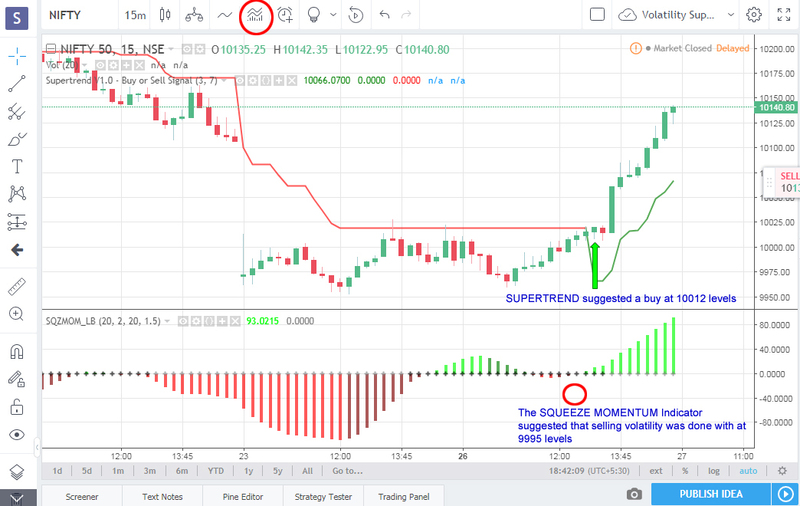 super trend and squeeze momentum indicator is free to use. I don’t see them in trending view. Could you please tell how you added these indicators? Sorry for this — Expecting everything for Free.. But, to ADD the Squeeze Momentum indicator and Ultimate MA-MTF Indicators — WE are being DIRECTED to go for the PAID version — suggesting that ONLY 3 indicators are ALLOWED(though I’ve ADDED ONLY the SUPER-TREND indicator) NOT only Vishal, I have been encountering the same issue..!! Shall be glad if you can clarify..!! Hi Sir , can you please share your view on Shri Keshav cements and infra. How is this company fundamentally. Sir, for all setups kindly explain the stop loss strategy also. Thanq. Sir, for a positional trading, what would be the moving average values you suggests? Sir, thanks for all these articles. Can you please let us know which has been been top 3 profitable trade set up for intraday.